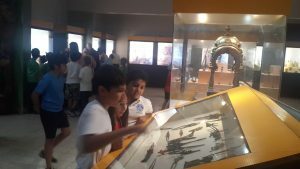 On 24th January, the PYP 3 visited the “Raja Dinkar Kelkar Museum” in Pune. The museum houses a huge collection of arts and artifacts all collected by a single individual, Dr. Kelkar. The collections showcased a glimpse of the culture and beliefs of India, as a whole in the past. These were preserved from all over india, including remote corners of the south and east of the country. The collections were sorted and classified under broad categories comprising oil lamps, beauty and culture equipment, arms, toys, musical equipments, sculpture, textiles, and kitchen utensils, giving students an idea of the rich essence of what life could have been in ancient India. 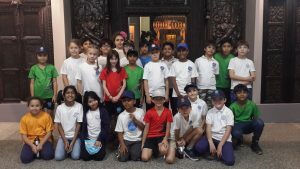 Not only did the children learn about the past through this visit but also realized that preserving, documenting and caring for our present world would provide footprints for future generations to know how to create a better human civilization. The high point of the museum visit was ‘Mastani Mahal’, ( a beautiful warrior princess ) which was a room dismantled from its original historical location preserved in this museum. All were amazed and astounded with all the intricate detailed work on walls,furniture and paintings. As we returned back to school, one could only imagine and wonder how a single individual could collect such valuable art and artifacts during his lifetime. This educational journey into the past will surely be a guide for the students as continue on their discovery of ancient civilizations.